I had little idea what to expect when turning up to St John the Evangelist church on a damp February evening for a concert that advertised itself “one of the most exciting performances imaginable”, incorporating music “from the worlds of classical, jazz, Latin, rock, blues and beyond”. Although passingly familiar with the oeuvre of Django Reinhardt and Stéphane Grappelli, I’d never before seen a contemporary gypsy jazz band live, let alone one that so ambitiously aimed to stretch the boundaries of the genre. I was therefore glad to find a large and convivial audience, many of whom were evidently aficionados who were already familiar with this group’s music – a woman selling CDs at the entrance asked if I’d seen Gypsy Fire before, and when I replied that I hadn’t, assured me that I was in for a treat. My first impression of the performance, however, was less than entirely positive: the concert opened with a performance of Vittorio Monti’s Czardas, which while expertly played, couldn’t help but feel a little hackneyed and unoriginal, and didn’t do a great deal for my expectations of what was to follow. Furthermore, despite the concert’s title of ‘Acoustic Spectacular’, the amplification for the first couple of numbers felt a little overblown for SJE’s intimate performance space and generous acoustic, with the detail and undoubted subtlety of all four performers’ playing tending to get lost in a wash of bottom-heavy sound. However, despite this slightly inauspicious start, things quickly began to pick up. Whatever problems there had been with the sound in the first one or two numbers appeared to have been fixed, as the band moved into a selection of original arrangements which demonstrated their talents to the full. Guitarist and founding member of the band, Stuart Carter-Smith, introduced the audience to a wide range of familiar music spanning two full centuries from baroque to bebop. While the (perhaps over-)familiarity of much of the material might have been disappointing, it turned out in the main to be a positive, as it allowed the quiet virtuosity of these musicians’ playing, and the inventiveness of many of the arrangements, to come to the fore. The results of such ingenuity were mixed, but the quality of the performances was never in doubt and ultimately outweighed any negatives. A rendition of Handel’s ‘Arrival of the Queen of Sheba’ showcased classically-trained violinist Ben Holder’s technique and musicianship to great effect, but the arrangement was a little disappointingly straight-laced and could have done with rather more punch and irreverence to transfer successfully to the gypsy jazz idiom. A jazz medley, on the other hand – described, tongue-in-cheek, as ‘the entire history of jazz in three minutes’ – managed with admirable success and real creativity to weave together Gershwin’s I Got Rhythm and Charlie Parker’s Anthropology, together with substantial sections of original material, and showed off some tastefully exuberant solo playing, in particular from guitarist Will Barnes and bass player Paul Jefferies. The second set, however, was where the musicians’ talents really came into the spotlight. With the band members reappearing dressed down, and engaging in laid-back yet engaging and genuinely entertaining banter between numbers, we were treated to another medley, this time of film themes, rock and pop songs, which in places ran the risk of cliché but for the most part were both arranged and performed with a great deal of panache. A simple yet effective and perfectly executed version of gypsy jazz classic Dark Eyes provided a nod to the group’s stylistic roots. The real highlight of the evening, however, had to be the final four pieces: an original composition by each of the four members of the band, featuring their contrasting musical personalities and backgrounds. A witty and clever latin-jazz number with the occasional Grappelli-esque inflection, by Paul Jefferies – a stalwart of the Oxford jazz scene – was followed by a composition by Will Barnes which daringly, and successfully, worked in elements from Barnes’ own musical background as a heavy metal guitarist. The set was rounded off by a more traditional – yet still fresh and inspired – tribute to Django Reinhardt by Stuart Carter-Smith, and a wild and exuberant up-tempo finale showcasing some truly virtuosic violin playing from Ben Holder. Despite my initial reservations, this ultimately turned out to be a highly enjoyable concert, and a chance to see some impeccable musicianship on display from four distinctive yet wholly complementary musicians. 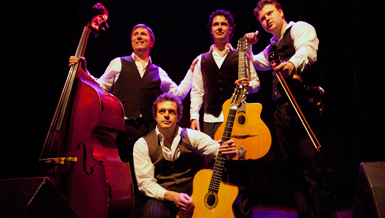 While I personally would have preferred the balance of the programme to have been shifted a little – with a higher proportion of original compositions, and perhaps more focus on the work of the group’s gypsy jazz forebears, interspersed with just a couple of lighter-hearted arrangements of familiar classics – there was a sense of genuine, heartfelt enjoyment from both audience and performers, and the evening definitely showed that these are musicians of serious talent. For future events in the St John’s series, please visit their website; more information about Gypsy Fire is available here.